Duck Family Day is a new feature for every Saturday where Oregon fans share their stories of …. being Oregon fans! Email charles@fishduck.com to share your experiences of you and your family and what it means to be a Duck fan. Graham Berry (below) is a writer for FishDuck.com and is extremely passionate about our beloved Ducks, the same as you and me. Contact us and share! 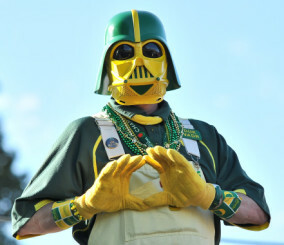 Duck Vader: the image of my father’s fandom. Prior to my recent marriage, only one other person had any inkling of my sports obsession: my fath percent er. As the veritable pusher of my now full-blown addiction to sports laundry [Ed. note: aka ‘Duck gear’] of various shapes, sizes, and colors, he proved to be a great instructor in the dancing lessons required of every sports fan. He taught me some of the basics of loving the Ducks: questioning the eyesight of the referees; yelling “GO! GO! GO!” as if we could make Ruben Droughns run faster; and sinking back into the La-Z-Boy whenever the gods crushed the sports fan’s twin pillars of happiness: hope and victory. He introduced me to the two-handed face grab (think Kevin in “Home Alone”) in response to a bad play. He invented the facepalm, or to our older readers, the move where you slap your forehead and slide your hand down to blind oneself from injustice on par with every episode of Law & Order: SVU. Having lived on the East Coast for more than 10 years, I am elated every time I see a Ducks sticker or a Ducks hat. On a shuttle to catch a flight at LaGuardia, I struck up a conversation with an airport worker from Long Island about the prospects of Marcus Mariota, then an unknown QB. Even now, living in New Haven, I have a neighbor with an Oregon license plate and a Ducks sticker with whom I want to discuss the prospects of the 2015 Ducks football season. I think the biggest connection we have between laundry and fandom is home: we love where we are from and the things that remind us of home. For me, home is not only the people, the environment, and the institutions to which you attach your affection and disappointment, but also the laundry for which you grew up cheering, the laundry you proudly wear on game day and the affection shared among fans of a particular team. I believe this is why sports fans love laundry as much as they do. They love it not because it’s lightning yellow and apple green, or ugly purple or even uglier gold. We love laundry because it reminds us of all that we associate with home, of all that we love — including the other team and their fans as well. We love laundry because home is not where the heart is, but the heart is where home is. FishDuck is, in its essence, an expression of that affection for a particular kind of laundry.